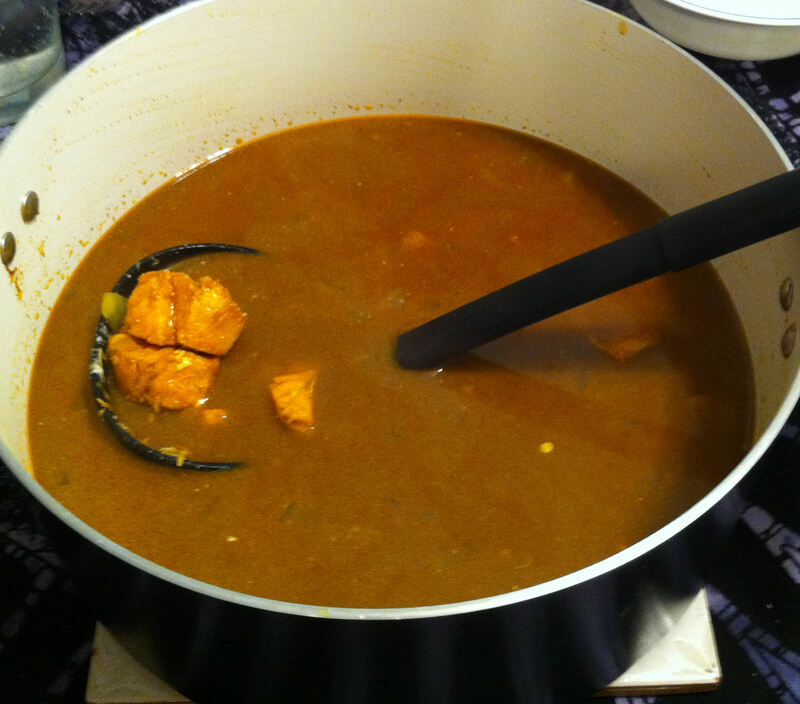 Son-in-law, Chris, requested a crab curry for this Sunday. It seems to be just past Dungeness season, so there was nothing but very expensive King crab in the stores. I bought some packaged crab meat and stretched it with some cod. Myr and Chris are on a low-carb Atkins diet, so any dishes with potatoes or rice are only for the starch eaters at the table. The recipes for the curries called for thickening them with some kind of starch. I decided to go the other way and add more fish stock and make it a soup. To go with this soup, I am making a saag and a lamb rogan josh. 1. Mix the marinade spices in a small spice shaker. 2. Cut the cod into one inch pieces and put them in a medium bowl. 3. Sprinkle the spice mix over the cod tossing to coat thoroughly. 4. Sprinkle the lemon juice over the fish and toss to coat. 5. Set the bowl, covered, into the refrigerator to marinate for 10-20 minutes. 6. Toast the coriander, cumin, and fennel seeds in a dry pan for two minutes and then process them to a powder. 7. Put the seed powder in a small bowl and add the chili and curry leaves. Set this aside. 8. Melt the ghee in a large pan and sauté the onions, over a medium high heat, until soft. 9. Add the garlic slices and sauté one minute more until fragrant. 10. Stir the contents of the spice bowl into the pan and sauté for one minute more. 11. Add the fish stock and bring the pot to a boil. 12. Reduce the heat and simmer for five minutes, covered. 13. Use some of the pot liquid to dissolve the tamarind paste and the stir it into the pot. 14. Add the codfish and continue simmering, covered, for five more minutes. 15. Stir in the crab meat and yogurt and simmer two minutes more. 16. Serve immediately and garnished with a dollop of yogurt, if you wish.